Cooked or roasted: chestnuts have always been my most favourite treat during my childhood and so they are nowdays. 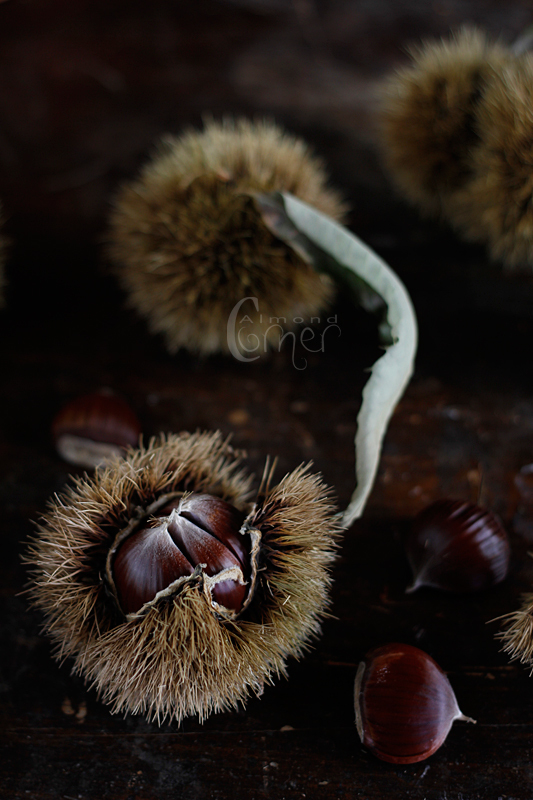 I haven't had chestnut puree for years meanwhile, so I bought a pack last weekend. Instead of serving it as vermicelles I decided to bake something with it. It was also a great opportunity to use some of the treasured chestnut flour. I also added some pears, and if pears, well then chocolate is also not far, right? To make the whole thing a little more exciting, I flavoured the cake with anise and orange. By the way, don't forget to serve a nice portion of beaten heavy cream with it! It's a must! Preaheat the oven to 180°C. Beat butter with sugar until fluffy. Beat in the chestnut puree, orange juice and zest, vanilla extract, anise and the egg yolks. Peel pears and cut in about half a centimeter sized cubes. Sift chestnut and buckwheat flour among the baking powder on top of the batter and stir until it is mixed well. Beat the egg whites to stiff peaks and fold it into the batter. Finally stir in the pear and pour batter onto a 18 cm round baking form. 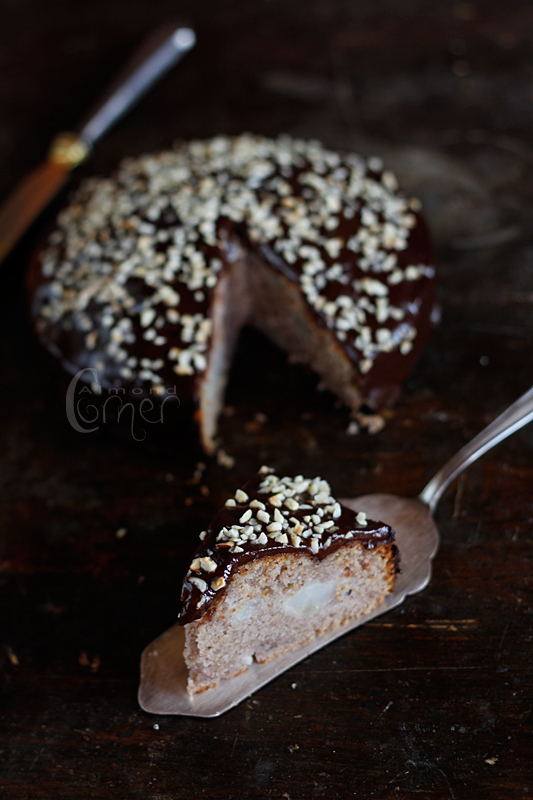 Bake cake for 40-50 minutes. For the glaze melt all the ingredients over low heat and stir until it is well mixed. 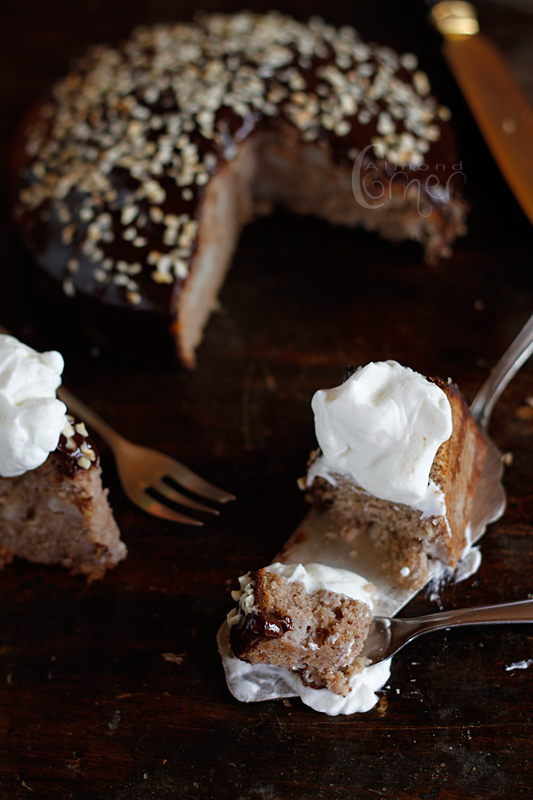 Pour it over the cold cake and decorate with coarsly chopped hazelnut. I love this season. The huge rains or walking over the sizzling autumn leaves on a sunny day. And you find plenty of vegetables on the market! I would say it is the best time of the year! 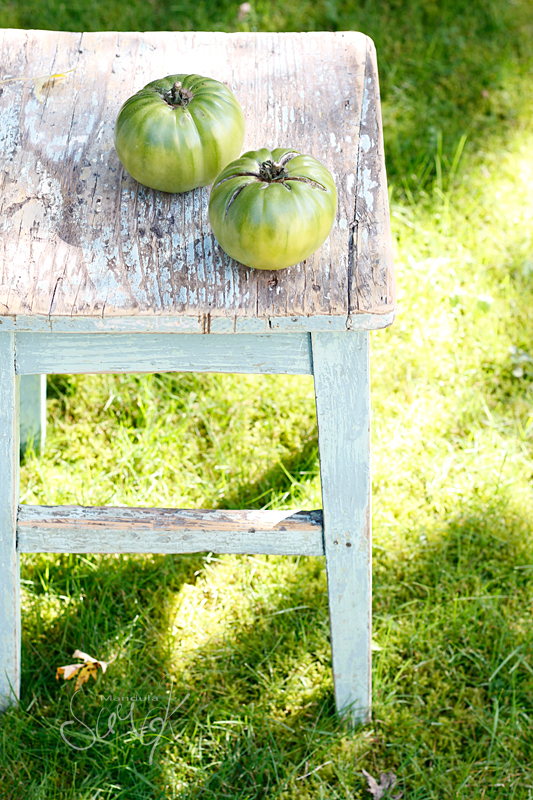 The tastiest aubergines, apples, pears, plums, grapes and tomatoes! Loads of tomatoes and they are so aromatic! Right now it is time to enjoy them as often as you can. Because soon it is over. And the pumpkins remind you irreversibly that autumn has arrived. However today we had such a wonderful sunny day! So, I just grabbed my photo equipment and spent a few hours outside, enjoying the probably last strokes of the summer sun. For lunch I prepared a simple, yet very flavourful crumble: tomatoes topped with goat's milk cheese crumble scented with the unique fragrance of fresh basil. Preheat the oven to 180°C. Brush two small baking forms with olive oil. For the crumbel mix together the goat's milk cream cheese, cane sugar, flour and oat flakes. Season with salt and pepper. Cut tomatoes and place them into the oven proof form and sprinkle the crumble on top. 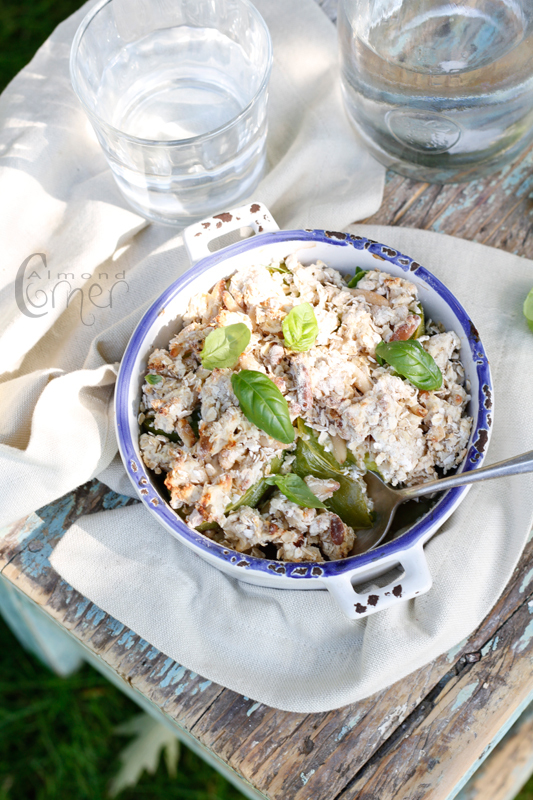 Bake for about 20 minutes and serve with fresh basil. The last kick has been given by the elderberry-apple jam, though I was curious about the beetroot-elderberry combination already since quite a long while. As the three are pretty great together, I decided to combine them in a soup. 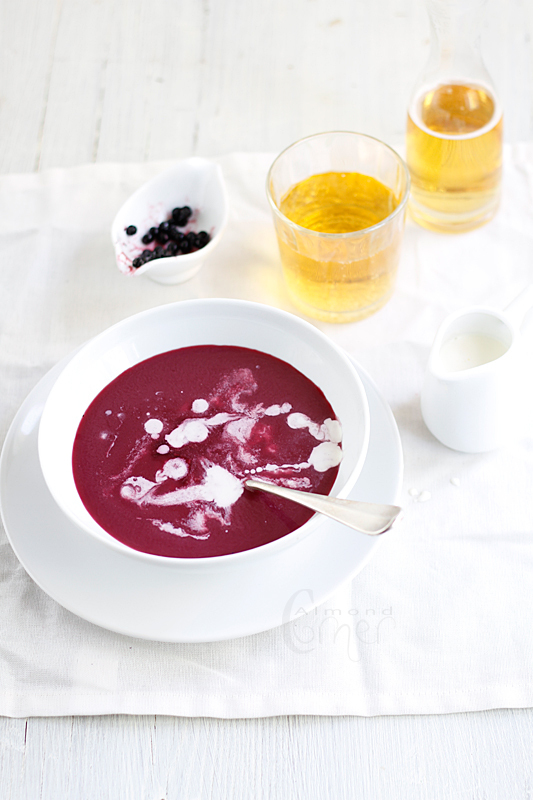 Its colour is definitely dominated by the berries and even stronger, because I used chioggia beet instead the normal ones. Chioggia has a much sweeter and almost no earthy taste, therefore the soup is very fruity. It is a nice autumn meal that warms you for sure and brings a smile on your face with its gorgeous colour. Ah, and just leave the cream and you won't have to care about the calories! Peel and dice apple and beetroot. Dislodge the berries from the stem. Over low heat melt butter, add cane sugar and let it caramelise. Add beetroot and 50 ml of apple cider and let it reduce. Now add the apple, the berries, the rest of the cider and the water or apple juice or even beet juice. Cook for 15-20 minutes, then puree and mash it through a strainer. Add vanilla extract and serve with a few drops of cream. It's beetroot time again! Okay, not that I have stopped consuming beets during summer, but the autumn-winter season has just started here at the "corner". Guess what? I already have plenty of new ideas, so expect some recipes coming your way these days. This starter is pretty light, okay, only if you close one eye above the crème fraîche based horseradish mousse. Lately, I am a fool for smoked trout and if smoked fish and horseradish, well then you can be sure that beetroot is also not far away! The raspberries? Beets and these little red berries are great together and believe me that smoked trout is just the right choice to be served with! Preheat the oven to 100°C. Cut bread in any shape you desire and dry in the oven for 30-40 minutes. Soak gelatine sheets in cold water. Stir in freshly grated horseradish into the crème fraîche. Season with salt, pepper and dill. Fold in the beaten cream. In a terrine form place a layer of smoked trout, top it with horseradish mousse and continue until there is nothing left. If you like you can also chop the fish and fold it into the mousse, that way it is going to be easier to serve. Chill for 4-5 hours. For the vinaigrette puree raspberries, then mash it through a strainer in order to discard seeds. Mix it together with the rest of the ingredients and season. 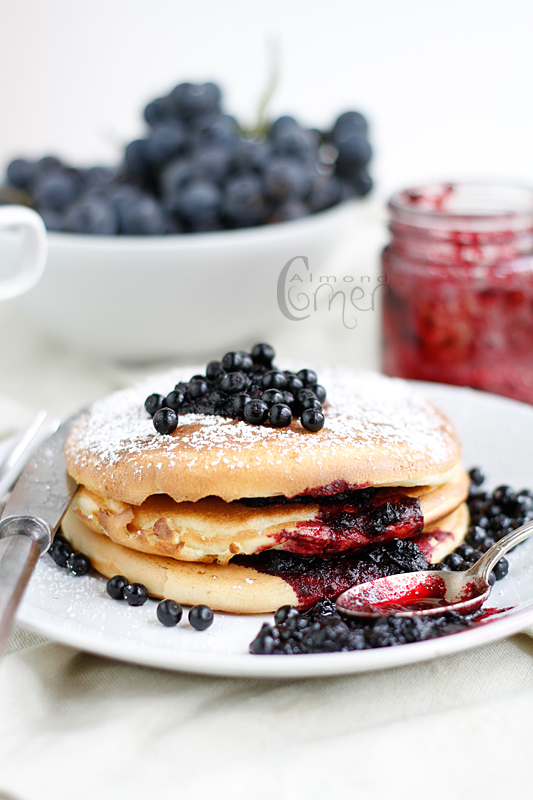 In case the berries are not that sweet, you might want to leave out the vinegar, so taste it before you add any! Season with salt and pepper. Peel beets and cut in stripes. Melt butter and over low heat cook the yellow beet. 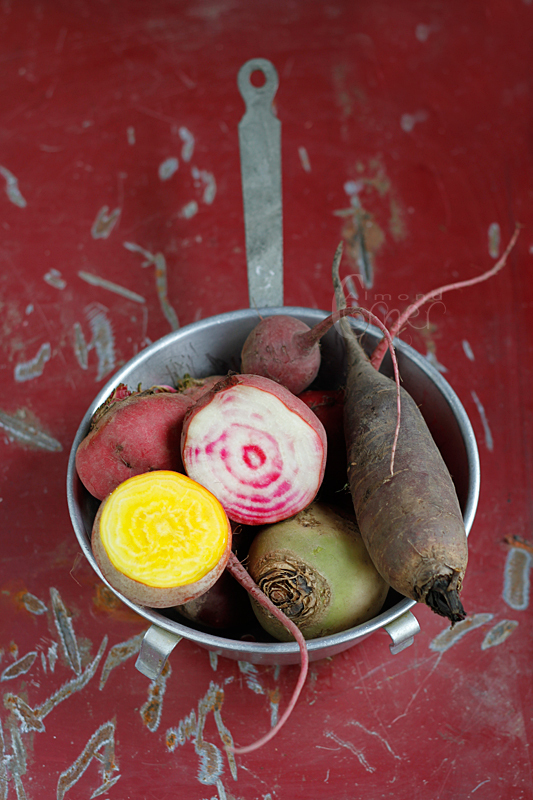 Before serving mix it together with the raw chioggia beet. 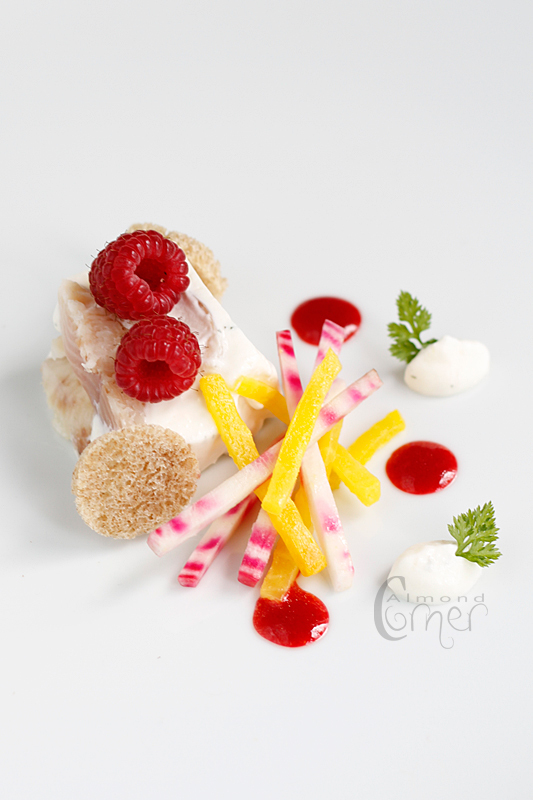 Season and serve with the vinaigrette, few raspberries and bread chips. How much I adore elder, both the flower and the berry! The smell of elderflower is so unique and look at those deep purple colour of the berries! Irresistible! 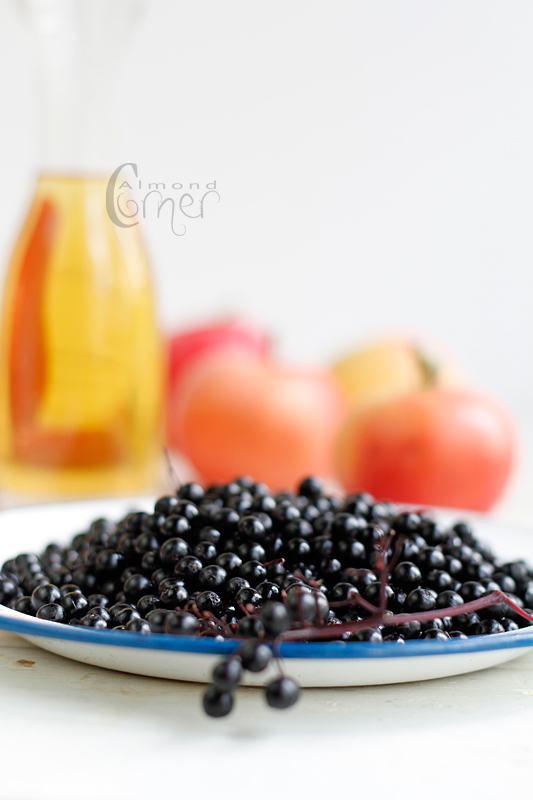 I have already decided last autumn, that this year I am going to make some elderberry jam, no matter what! I decided to combine it with apple, not only because they go well together, but also because I had no agar-agar or pectin at home, so I had to do something in order to achieve the right consistency. I confess that I do not like fruit pieces in a jam, so usually I puree it. However as far as blueberries and elderberry is concerned, I just can't get enough of them! So therefore I cooked the apple in the cider and pureed it, and only after that I added the elder, sugar and lemon juice. The lemon juice is a must, because that is what gives the jam a zesty note. For the jam remove the core of the apple and dice with the peel on. Bring apple with the cider to the boil and cook until soft, then puree. 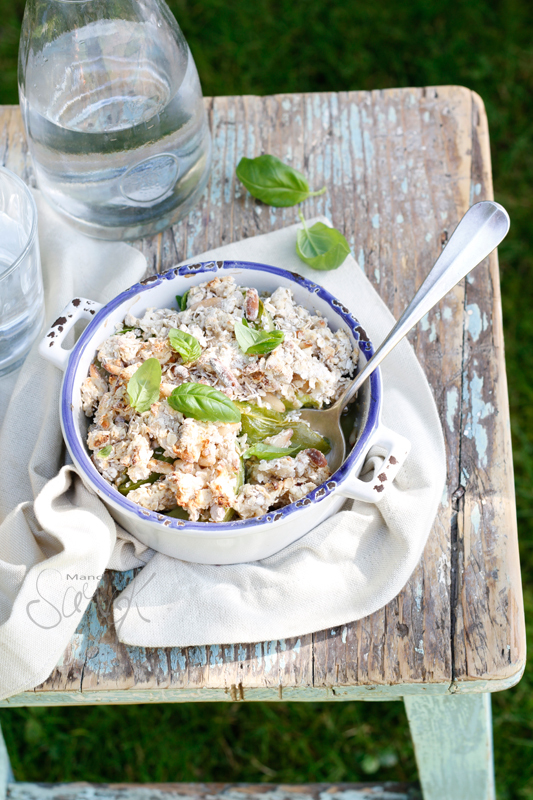 If you do not want to waste time with this extra step, just cook everything together from the begining. I did it that way, because I wanted no apple chunks in the jam. 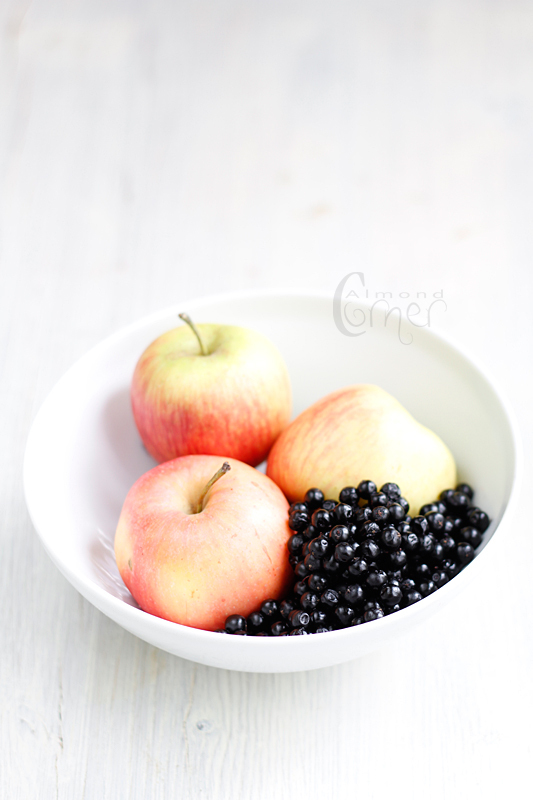 So now it is time to add the elderberries to the apple pure among the sugar and the lemon juice and cook for 35-40 minutes. If you want a less runny consistency add about 5 grams of agar agar or pectin. 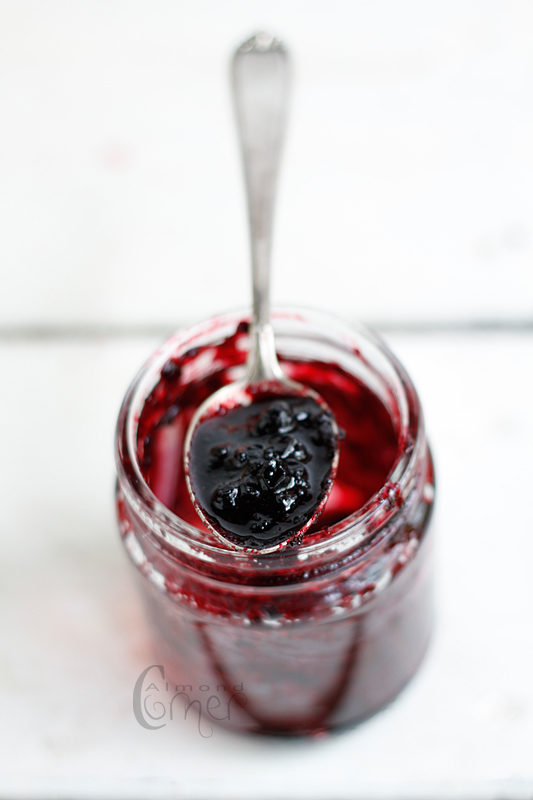 Pour the hot jam into jars and let it cool covered under a bunch of blankets. For the pancakes mix the ingredients together until smooth. Heat a frying pan and pour a ladle of the batter into the pan. Cook for 2-3 minutes or until bubbles appear on the surface, then turn and cook for a further 1-2 minutes or until golden. The batter makes 3-6 pieces depending on its size. 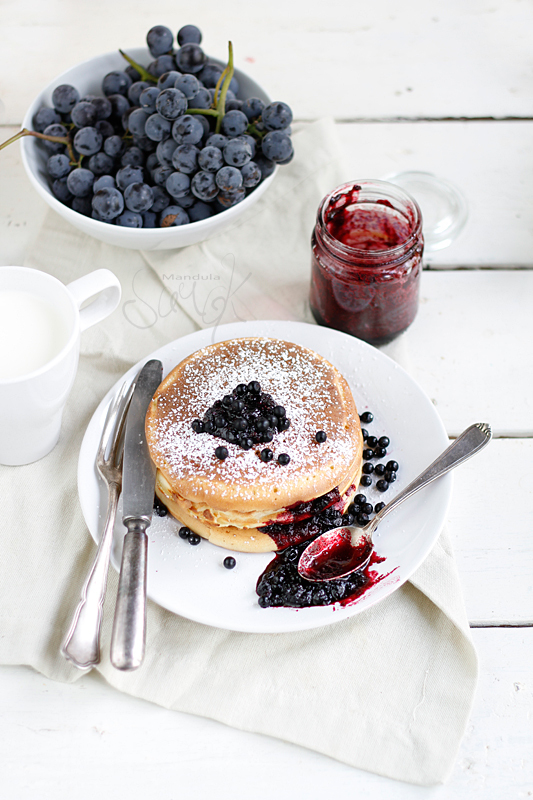 I usually do not add any sugar to the batter, because we eat it with loads of syrup, but feel free to add some. Again, it's been a while since my last post. Well, I've been busy with a lot of food related things. One of them was the Dining Guide Street Food Show in Budapest, where I was invited as a guest blogger. I was in the same team with Robert from myBites, with whom I already had the pleasure to be part of a cooking competiton in Berlin last summer. Both of us decided to serve a Hungarian dish: his was the so called letscho, that he prepared in a a very unusual, yet totally fantastic way: in a form of a sushi. I decided to take a twist on the classic dessert: the Rákóczi túrós - kind of a quark cake. I served my version in glass and preapred its elements seperately. The bottom is a short crust pastry, above a layer of curd cheese, some apricot jam topped with meringue. My version plays with the temperatures: I served the home made apricot jam warm, then comes a layer of cold curd cheese mousse, some kind of sablée crumbs and finally meringue. I recieved a lot of feedback from the visitors of the food show and all in all it was an amazing day! 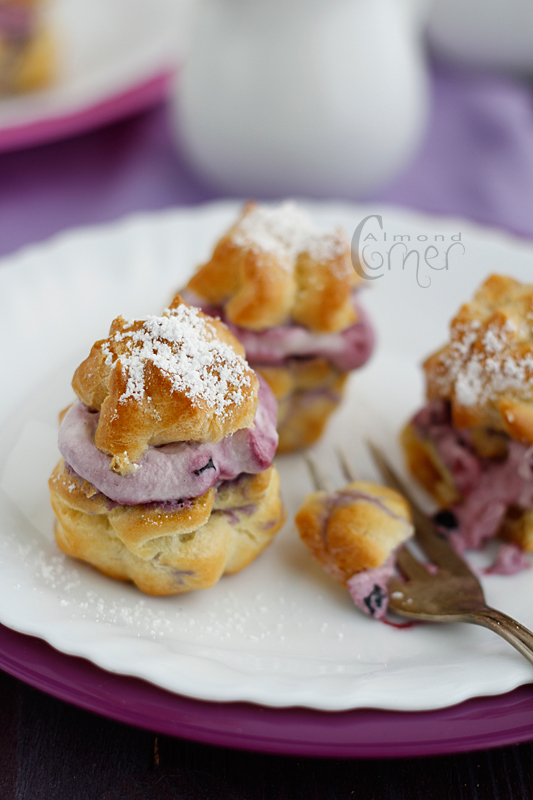 Anyway, now all back to normal and therefore enjoy these little cream puffs! 150 ml creamPreheat the oven to 180°C. Bring the milk, butter and salt to the boil. Add the flour and use a wooden spoon to beat until well combined. Put it back to the heat and stir until it begins to come away from the side of the saucepan and you see a light white film on the bottom of the saucepan. Take it again away from the heat and stir in the eggs one by one. 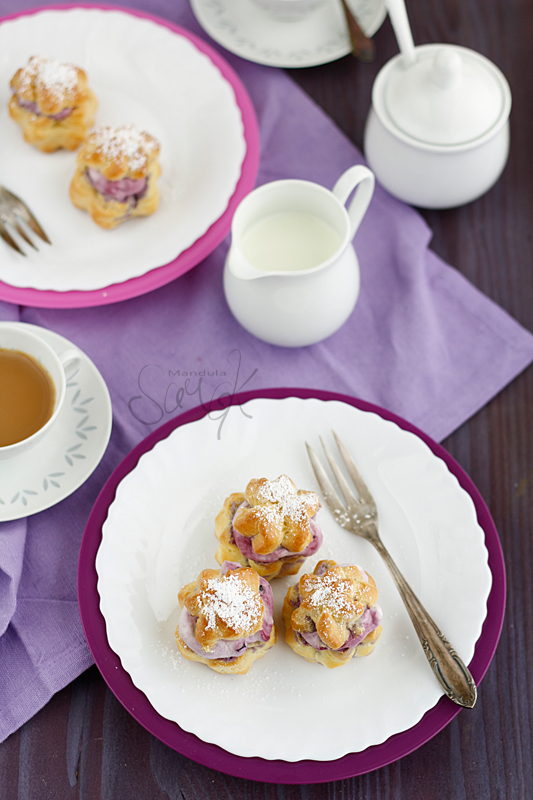 Pour batter into a piping bag and pipe cream puffs onto a baking paper covered sheet and bake for 15-20 minutes. For the filling bring elderberries with vanilla sugar, port wine and water to the boil anad cook for 2 minutes over low heat. Now mix some of the juice in a small bowl with the corn starch and stir it to the rest of the berries. Cook for another 3-4 minutes over high heat. Let it cool. Beat cream and fold in the elderberry sauce. 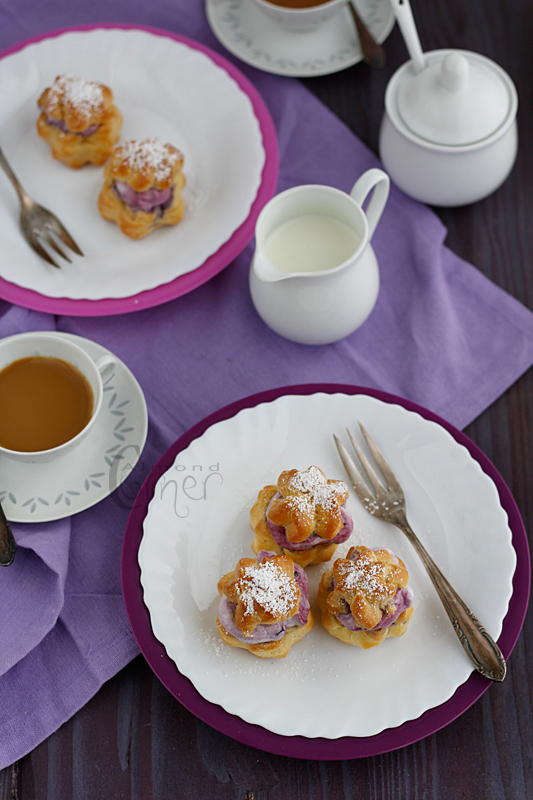 Fill the cream puffs with elderberry cream and serve immediately.